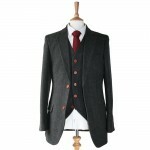 Introducing our classic tweed hand stitched flagship suit. 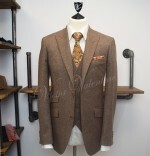 Made from the absolute highest quality 100% wool 270gsm & finished with a modern slim fit. The vintage brown wooden buttons add a perfect finishing touch. It simply does not get any better than this. Excellent service from Victor Valentine. I bought this suit for my wedding and it fits perfectly. Damon was very helpful and efficient! Would throughly recommend Viictor Valentine and this suit.